No JVM could be found on your system. Please define EXE4J_JAVA_HOME to point to an installed 32-bit / 64-bit JDK or JRE or download a JRE from www.java.com. This is very common error faced by Windows users when they try to run Java based applications and Windows can not find Java Runtime Environment which is required to run Java Apps. This error is also faced by thousands of Minecraft users. Java is required to run Minecraft and all other games which are made in Java. Java enables developer to create cross-platform applications. Verify that Java is installed in your computer, browse Start > Computer > Local Disk (C:/) > Program Files > Java > jre8. Select the path by right clicking on Path and choose Copy address. Now open Computer > System Properties >Advanced system settings > Advanced > Enviroment Variables. 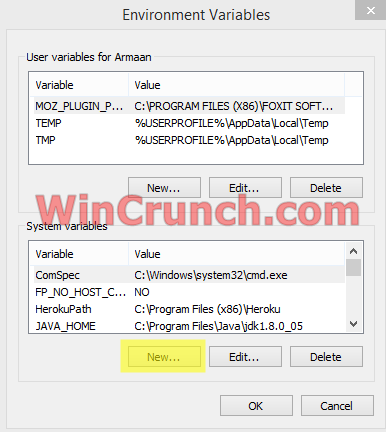 Click the “New” button in the System Variables area and enter following details. Press Ok and restart your computer. In Windows 64 versions, Java is installed in “Program Files”, not in “Program Files (x86)”. Run JavaRa.exe, choose the language of your choice. Then click Remove Older Versions. Accept any prompts. Open JavaRa.exe again and select Search For Updates. Select Update Using Sun Java’s Website then click Search and click on the Open Webpage button. Download and install the latest Java Runtime Environment (JRE) version for your computer. If JavaRA can not delete the old version from your computer, try Revo Uninstaller to delete it. Next articleWhat is SysWoW64 Folder in Windows? 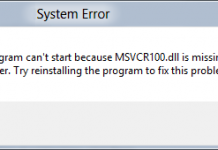 How to Fix MSVCR110.dll missing error? 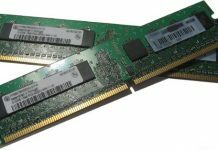 Why does Windows show less than 4GB of RAM? 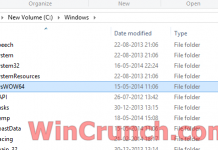 What is SysWoW64 Folder in Windows?